The veins in your arms have a single purpose. Their job is to carry the blood from your hands back to your heart. Some people are alarmed when they notice that their arm veins have become more pronounced or bulge. For better or worse, many people have prominent or bulging veins on their arms. You may wonder if these visible veins signify an underlying health issue. They could, but most often the visible veins in your arms are entirely benign, even if they are bulging. Bulging arm veins have many causes. If you are quite thin, your veins may appear more prominent than the veins of a person who has a bit more body fat. Body fat often covers large veins. When you are thinner, the veins have no place to hide. When you have a lot of solid muscle in your arm, your veins are supported by muscle fibers. This lifts the vein and closer to the surface of your skin. This is known as vascularity in weight training circles. Many weightlifting enthusiasts consider visible arm veins as a desirable indication of increased muscle mass. 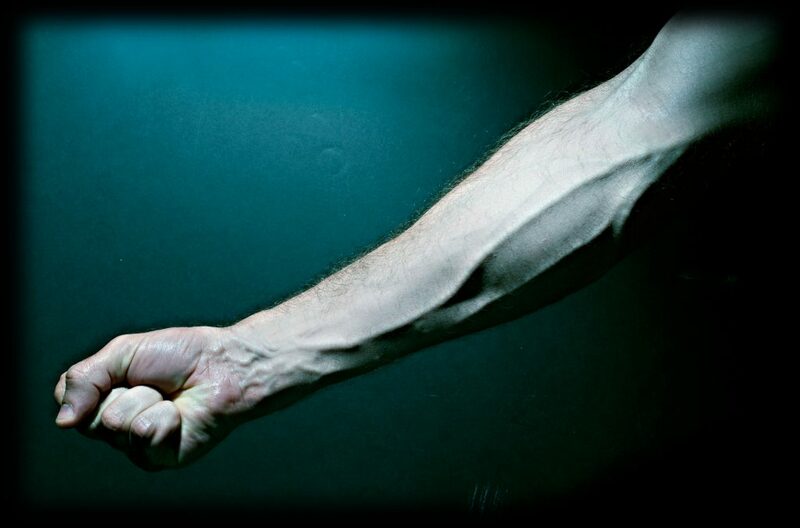 Your bulging arm veins could be gaining envious glances that you are not even aware of. For example, there is a popular bodybuilding saying; Veins and Gains. Your body produces less collagen as a result of the aging process. It is also quite natural to lose body fat in some areas while gaining fat deposits it in others. As a result of collagen and fat loss, your skin becomes noticeably thinner. This can result in previously normal looking arm veins appearing more prominent. You may have noticed that arm and hand veins are more pronounced in the elderly. Genetics play a role in the size and visibility of your arm veins. Take a closer look at the arm veins of some of your closest family members. You may not have noticed before, but they could have the same type of prominent veins you see in your own arms. If you are also fair skinned, this could be hitting your arm veins with a double whammy. Veins typically appear more prominent on those with fair skin. Dysfunction within your blood vessels can cause your arm veins to appear more pronounced. Smoking and high blood pressure can also contribute to bulging arm veins. If you notice pain or swelling accompanying the bulging in your veins, it is best to consult with your healthcare provider or a vein specialist. A regular cardiovascular workout can significantly benefit the health of your veins. When you exercise, you boost your circulation and help your blood flow freely. This can help keep your blood from pooling in your veins. Your improved circulation could minimize the appearance of arm veins. Similar to cardiovascular activity, stretching your arms will also help keep blood from pooling in your veins. You may notice the veins collapse or become less prominent as you work the muscles around them. As the muscles of your arms contract and expand, the size of your veins could decrease. A nutrient-rich diet will help ensure the health and strength of your entire circulatory system. Be sure to include plenty of antioxidants while avoiding alcohol, excess sugar, sodium and caffeine. These substances cause blood vessel dilation and may cause your veins to be more prominent. If your self-help measures don’t significantly reduce the size of your arm veins and you are still disturbed by their appearance, your best course of action would be to consult with a vein specialist. There are several measures your specialist may suggest to safely eliminate the bulging veins in your arms. Unless your prominent veins are caused by weight-bearing exercise, there is not much that you can do to prevent them. Prominent or bulging veins are not typically a cause for concern but should be checked by a qualified professional if they cause you discomfort, swelling or pain. If your arm veins are a cosmetic concern, it may be best to consult with a qualified vein specialist for more information about your best treatment options.